Making a living in competitive gaming is difficult, but it’s even harder for folks living in Japan. The island nation limits prize money for video game tournaments, and also, strangely enough, its gambling regulations also apply to the world of esports. These two legal hurdles have made it almost impossible for competitors to maintain a feasible esports career without significant support from sponsors. A year ago, Japan started issuing official esports licenses, which would allow pro gamers to win and keep their prize money under certain conditions. However, the core issue reared its ugly head once again when a Street Fighter player who had previously refused to take a license won Evo Japan earlier this month. The Japan eSports Union (JeSU) was established in February 2018 as a way to legitimize pro gaming within the Japan’s notoriously anti-esports regulatory framework. By recognizing the competitive aspects of games like Street Fighter V and Winning Eleven 2018 and by partnering with their respective developers, JeSU planned to issue licenses that would allow competitors to bypass Japanese law and earn money playing games in tournaments. A small group of players were chosen across six games to act as inaugural licensees, and over time, more were eventually added as players won official competitions organized by Capcom, Bandai Namco, and other JeSU-partnered developers. Not everyone in Japan was happy with JeSU’s methods, though. When the organization’s plans were first announced, Capcom mentioned that one of the initial Street Fighter V players to whom they had offered licenses had rejected the opportunity. Rumors swirled that it was Street Fighter legend Yusuke Momochi who had turned down the JeSU license, and Momochi appeared to confirm those rumors with a lengthy blog post detailing his problems with the new system. While he agreed that something needed to be done in order to help professional gamers in Japan scratch out a living, he had a few key issues with how things were being decided by executives at JeSU. At this time, the awarding of licenses is completely at the discretion of the developers who have partnered with JeSU. Since last year, Capcom has regularly granted licenses to non-licensed players who happen to place in the money of official Street Fighter V events, but there’s nothing to stop Capcom from simply declining to do so in the future and withholding guaranteed prize money from competitors they may personally dislike or disagree with. Placing so much power in the hands of the developers allows them greater control over how their games are used in competition, which benefits those companies but also places the grassroots competitive scene in danger of getting swallowed up by developer-backed invitationals that may be considered more “official” than community-run tournaments. Momochi’s status as a non-licensed player surged back into the spotlight last weekend when he won Street Fighter V at Evo Japan. 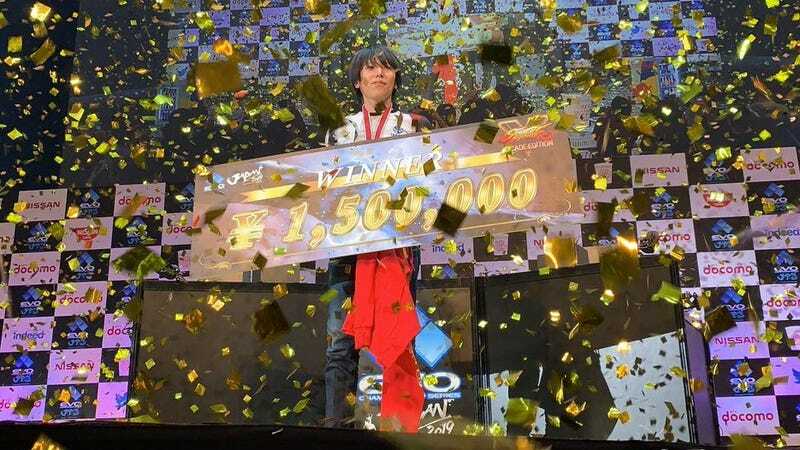 Without official JeSU recognition, the most money he can earn at events is just ¥100,000 JPY, which is about $900 USD, but as the Evo Japan champion, he was supposed to be awarded at least ¥1,500,000 JPY, or around $13,500 USD (CORRECTION 3:00 pm ET: This story originally misstated the amount of prize money Momochi won at Evo Japan). Would he be forced to leave thousands of dollars on the table? In speaking with Kotaku, an Evo Japan representative said that Momochi would receive all the money he earned from his victory, and Momochi said the same thing during a recent Twitch broadcast, but it was unclear how that could be possible with Japan’s stance on earning money via competitive gaming. Fortunately for both parties, there are a few ways for events to go around these strict regulations. As detailed in Kotaku’s previous reporting on the subject, Japan places competitive gaming in the same realm as gambling when it comes to funding prize pools with player registration fees (as is the case with most grassroots tournaments). The country’s laws also consider direct payouts from developers as being “geared towards selling a particular product” and limits these payouts to buckle down on “unjustifiable premiums and misleading representations.” Evo Japan, however, is funded by sponsors, the largest of which this year was NTT Docomo, a Japanese mobile phone carrier. Because the payout comes from a sponsor, that should, in theory, allow Momochi to get paid in full for winning Street Fighter V, and in turn he’ll be able to make money without neglecting his principles on the JeSU licensing process. It’s a win-win situation that some believed wasn’t possible shortly after Evo Japan’s conclusion. This should also extend to every Japanese player who earned money at the tournament. Japan’s esports situation is frustrating, but it’s important to remember that the country isn’t alone in making competitive gamers’ careers difficult. Despite being home to some amazing players, the Philippines implemented a number of regulations last year that threaten to hamper grassroots tournaments and dissuade international players from even setting foot in the country. Brazil’s own restrictions on payouts meant that Capcom Pro Tour events in the country have been regularly unable to provide the same prize money as their counterparts around the world. Japanese players are often able to find sponsorship and travel for competition due to the country’s status as a global fighting game hub; sadly, these are opportunities that players in the Philippines, Brazil, and other restrictive regions are rarely given, despite these players’ growing presence and skill within the community. These situations show that, unfortunately, the world at large is still struggling with the legitimacy of pro gaming as a career.